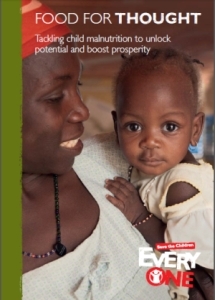 According to Save the Children’s new report, good nutrition can help kids learn and even earn more money when they grow up. That’s in addition to growing up healthy and strong, of course. But we’ve got to nourish our children first. There are 165 million children in the world who are chronically malnourished. Without a nutritious diet, kids can have trouble answering basic math problems and reading simple sentences. Their growth is often stunted. Malnourished children are often poor, lack education and access to good jobs. Even with these problems, Food for Thought shows us the opportunities. Well nourished children are 13% more likely to be in the correct grade at school, boosting lifelong skills. Fixing malnutrition now could bring economic benefits over 100 times as large as the costs of interventions. Why am I telling you all of this? Because President Obama and other world leaders are about to convene for the Nutrition for Growth summit in London in advance of this year’s G8 summit. You can make your voice heard by letting them know that all kids need to get healthy food. Join me, Save the Children, the Global Team of 200 and Mom Bloggers for Social Good in showing our world leaders that global nutrition should be on their agenda. If you’d like to earn your cape as a supermom in the kitchen, you can also share a healthy recipe for kids that either has 8 ingredients or costs under $8 to make. While I’m not much of a cook, I am lucky in that my kids love vegetables. 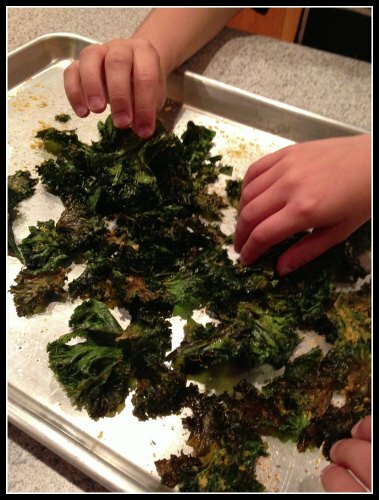 My good friend and food blogger, Linda D’Alessandro, shared with me her recipe for kale chips. They sound super yummy to me! Linda’s kale chips last about 5 minutes when she makes them! Toss kale (better if you massage them with your hands) in a big bowl with olive oil, coarse salt, a sprinkle of garlic powder and nutritional yeast. Spread the kale onto two rimmed baking sheets and bake it at 350°F for 10 – 12 minutes, making sure it doesn’t burn, and stirring it gently a couple of times. Note from Linda: It takes time to find the right balance between heat and cooking times, depending on the oven. So don’t give up after the first try! You can start with plain Kale chips without adding the nutritional yeast. My kids, hubby included, love it! Are you a supermom (or superdad!) that cares about good nutrition for all kids? For today’s Philanthropy Friday, I’m asking you to incorporate giving back into your life by tweeting, sharing this post or writing your own post to support global nutrition. Ilene recently posted..I’m Mom of the Year! I’ve been wanting to try kale chips for a while! Well, there you go! My friend’s kids absolutely love them. OMG – kale chips are da bomb! LOL And wonderful message here about the kiddos. I have yet to try them. They look really good! I’m not a big fan of kale, but love kale chips. Stopping by from Saturday ShareFest! The foods we eat make such a difference. It’s amazing how some subtle changes can make you feel so much better. It’s sad to think kids aren’t moving forward because they don’t have decent food to eat. Gives us some perspective, doesn’t it? I have great appreciation for your topic. I firmly believe that cooking one’s own food is important for personal and global health. Stopping by from SITs! Have a great weekend! Can you imagine if we were all able to eat food we grow ourselves? How great that would be! Thanks for stopping by! Thank you for featuring the Kale chips recipe on your post. It was hard to get my kids’ hands still to take the picture, they were impatient to eat them! Kale is one of my favorite veggies, in juices, smoothies, as side dish and salad!! Hope to see you soon!! Take care! Thanks for sharing the recipe, Linda. I think it’s a hit! Can’t wait to make it! ❤ Julie Maloney ❤ (@Momspective) recently posted..Summer’s Here. Now What? Thanks for your support, Julie. I appreciate it!